Deer shifter Mary North may be afraid of snakes, planes, tropical diseases, and strange people, but when fate hands her a solo vacation at the luxurious, all-inclusive Shifting Sands Resort, she's determined to overcome her own timidity and enjoy herself. She isn’t prepared to meet her own mate - and find out he doesn’t want her. Neal Byrne was an elite member of the military before he was captured and tortured in a private zoo for a collector’s amusement, forced to remain in his wolf form for ten years. He’s working at Shifting Sands now, doing whatever odd work he can find, and trying to heal his emotional wounds. He knows he’s not fit for a mate, and he’s sure the beautiful, gentle Mary would be better off without him. When an accident traps the two in an isolated slice of paradise, injured and alone, it will take all their courage and trust to survive. Can two hurt souls find healing at last, or will their fears keep them forever alone? 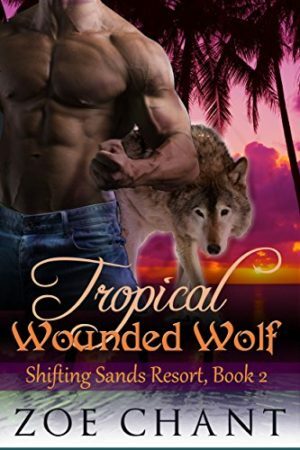 Tropical Wounded Wolf is a ​thrilling, standalone short wolf shifter romance. No cliffhangers!